The IS-linked Amaq news agency said two fighters “detonated explosive belts at a gathering of Shia” in Kabul. The attack in Deh Mazang square targeted thousands from the Shia Hazara minority who were protesting over a new power line, saying its route bypasses provinces where many of them live. 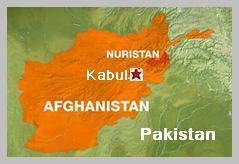 The Taliban have condemned the attack. Spokesperson Zabiullah Mujahid sent an e-mail to the media saying they were not behind it. Self-styled IS has a presence in Eastern Afghanistan but has not previously admitted carrying out assaults in the capital.